Overall we are very pleased. The outfit is easy for Jordan to get on and off (so important for little ones). The vest-top bibs are definitely our favorite feature. 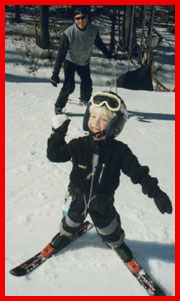 It has been unseasonably warm and Jordan has done a lot of day skiing without the jacket. The vest top makes for a very nice fit. 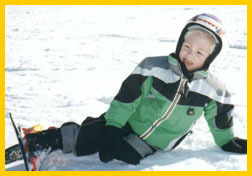 On the occasional cold day (this season), Jordan never complained about being cold or uncomfortable. Overall the outfit has held up well given how active Jordan is. The shoulder seam on the vest top is pulling apart and one of the plastic snaps on the fleece has popped off. Otherwise, it is holding up well. It really washes up nice. It has been washed several times and the color does not seem to be fading. 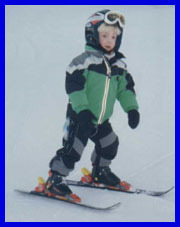 Jordan has used the outfit mainly for skiing. 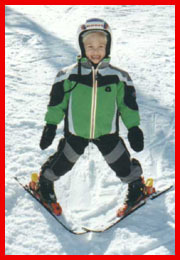 We have skied about fifteen days this season. Mostly at Hidden Valley but we also skied at Seven Springs. We hear a lot of comments from other skiers in the lift line and on the lift about the uniqueness of the outfit, the nice color combination, and style of the outfit. It is an outfit we would pick again. Or visit Obermeyer.com for more information on how to buy their products.